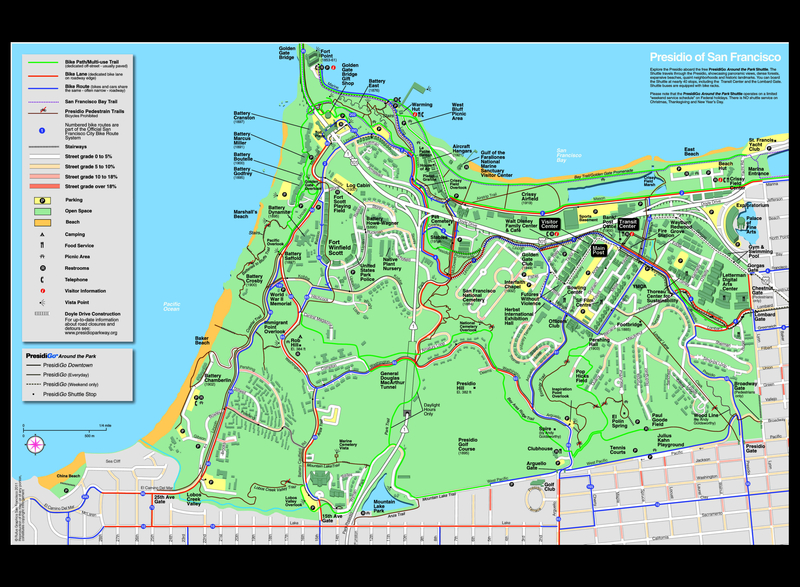 Presidio Coastal Trail is a 2.7 mile one way hike with 200 feet accumulated elevation gain. Located 5 miles north of San Francisco California. The trailhead is car accessible. July and August are the best months to enjoy this hike. A section of the California Coastal Trail that takes you from the Golden Gate Bridge visitor center above Fort Point to Baker Beach. The trail takes you above the bluffs and connects many of the old batteries dotting this strategic high grounds of the Presidio. I understand that many sections have been closed due to storm erosion, but in October 2013 signs of recent reconstruction have led to its reopening. Check out => http://www.presidio.gov/explore/trails/Pages/california-coastal-trail.aspx#.Um73GzK9KSN for more information.